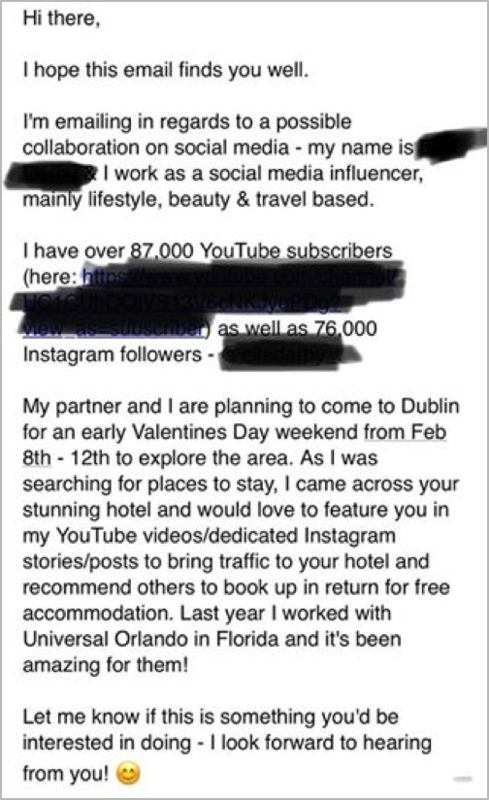 In case you haven’t been tuning in to the Twittersphere, or if you’re not up-to-date with all the latest Instagram and Facebook gossip over the last week, you should know that there’s been a brutal showdown between a self-proclaimed social media influencer Elle Darby and the owner of The White Moose, a five-star hotel in Dublin. Since then, Elle has received a rush of backlash with comments to the tune of entitled and shameless, while Paul has also received his fair share of haters who disapprove of his public shaming and petty approach. The digital landscape has given opportunity to new methods of advertising and marketing, especially through social media icons and influencers. The question is, how have influencers been utilizing this platform, and are they crossing a line? The culture of social media and online influencers has raised concerns for businesses, as influencers are being viewed as destructive and self-entitled. 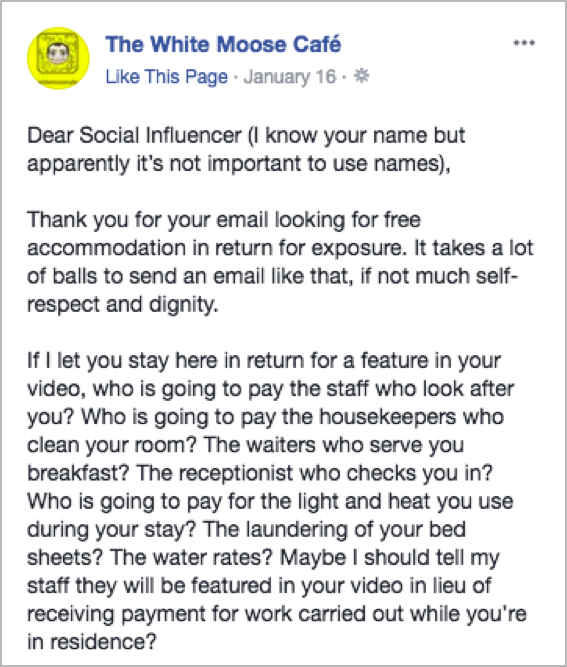 Outraged by the progression of social media influencers, some businesses believe that the extortion of restaurants, hotels and other entities is not only bad for business, but it is an inorganic way of gaining attention. Without a large supply of travel content, Elle cannot claim that her followers care about where she travels to. The White Moose Hotel has over 186,000 followers themselves- meaning Elle would benefit much more from the hotel’s exposure than vice versa. Although Elle’s request conveyed a sense of self-entitlement without offering genuine value, business owners should consider partnering with social media influencers, especially if it targets the right audience. In Paul’s case, Elle’s followers are of no benefit to his marketing strategy, but ultimately, his harsh and not-so subtle rejection may have caused more harm to him and his business than collaborating with Elle. That being said, partnerships between businesses and the right social media influencers have proven to be successful in the current digital age, and generate loads of attention by a loyal audience. But, as evidenced by this case of Paul and Elle, such partnerships can be tricky, and they shouldn't be taken lightly either- it is, after all, a marketing trend that is going to stay for a while.